With so much Nirvana material now available — officially or unofficially — it’s possible to take a shot at tracking the peaks and troughs of Kurt Cobain’s song-writing. Take a look. This may vary as more information becomes available (in which case I’ll update this), however the basic point is extremely clear. 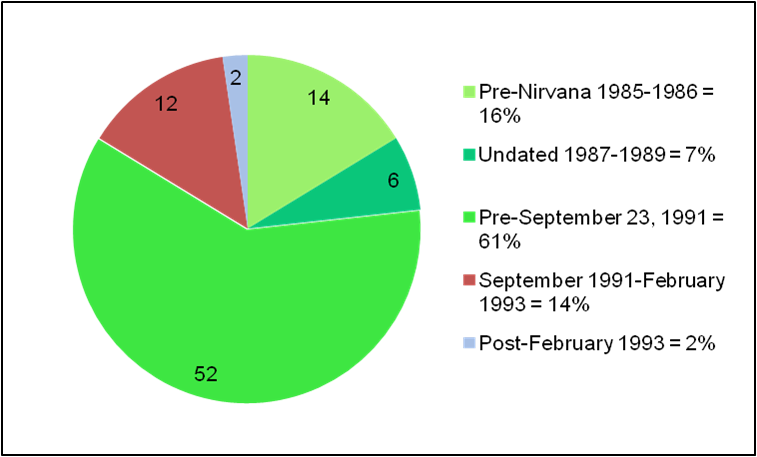 Kurt Cobain produced 84% of his songs (with Nirvana and solo) prior to Nevermind being released. That figure may, in fact, be even higher. Curmudgeon debuted in October 1991 suggesting it had been written prior to Nevermind’s release. Meanwhile the main riff from Tourette’s is performed at a sound-check in Vienna in November and, according to Gillian G Gaar’s book Entertain Us, Krist Novoselic believes the song was written in 1989. She also states that a 1987 practice tape features two additional unknown compositions Nirvana were jamming on. This leaves Heart Shaped Box, Serve the Servants, Very Ape, Milk It, M.V., Scentless Apprentice, Frances Farmer Will Have Her Revenge on Seattle, I Hate Myself and I Want to Die, Gallons of Rubbing Alcohol Flow Through the Strip plus The Other Improv — with You Know You’re Right and Do Re Mi the only results of the final thirteen months. Does it matter? Well, I’d argue yes. It suggests that Nirvana, at the height of their fame between 1992-1994, barely existed as a productive and creative group, they just tidied up leftovers. It also suggests Kurt Cobain’s crisis leading to his death was not a short-term crash sparked in 1994. Instead it looks like part of a malaise stretched over a significant period of time, around thirty months in which he barely wrote a fresh note. Nirvana: Why More? Why Now?